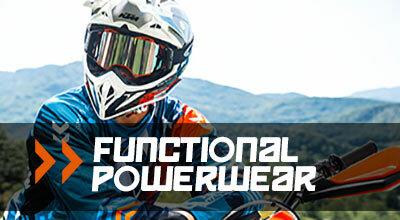 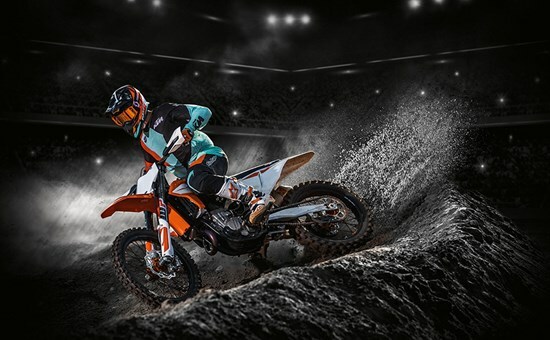 The 450cc engine is the ultimate powerhouse when it comes to KTM’s competitive motocross range. 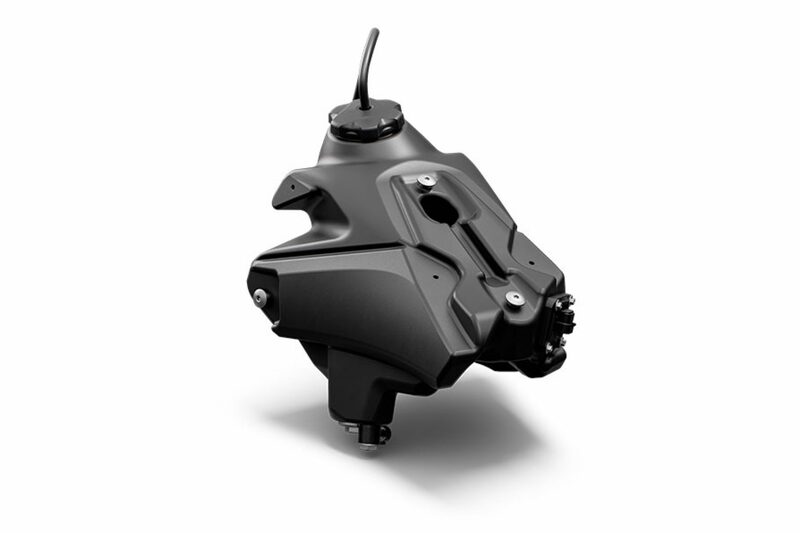 Significantly reworked for 2019, it features even more compact dimensions and reduced weight. 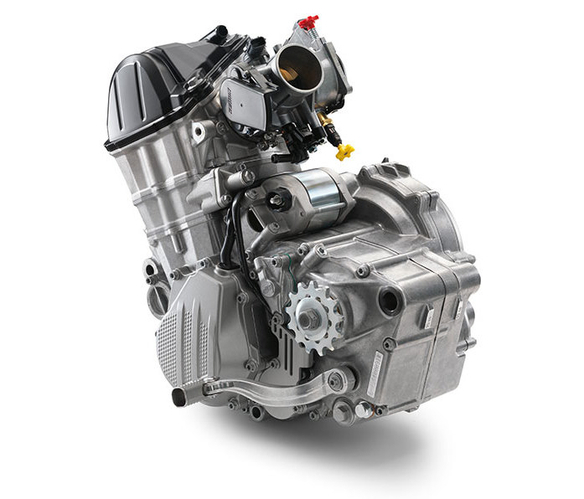 It is fitted with a newly designed, extremely compact single overhead camshaft cylinder head and the latest electronic fuel injection. 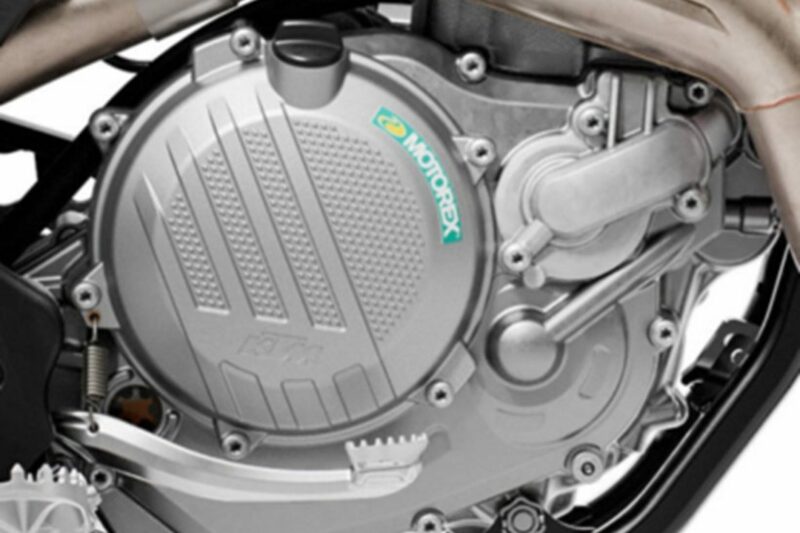 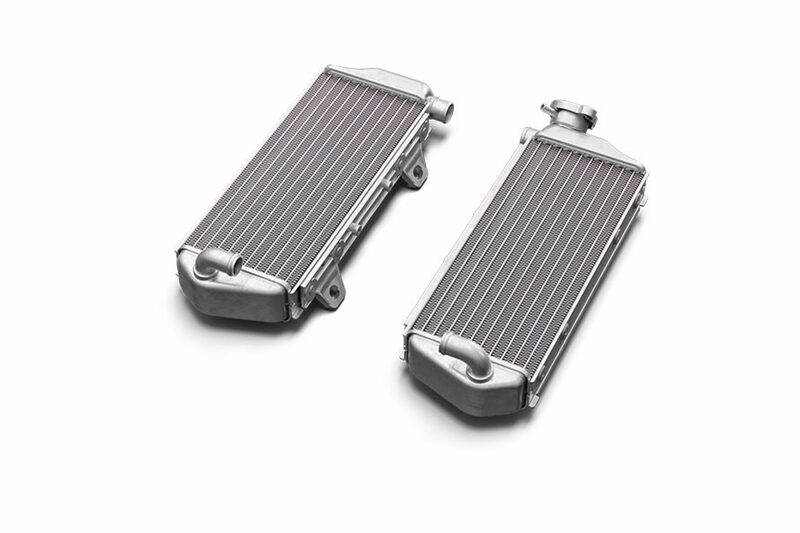 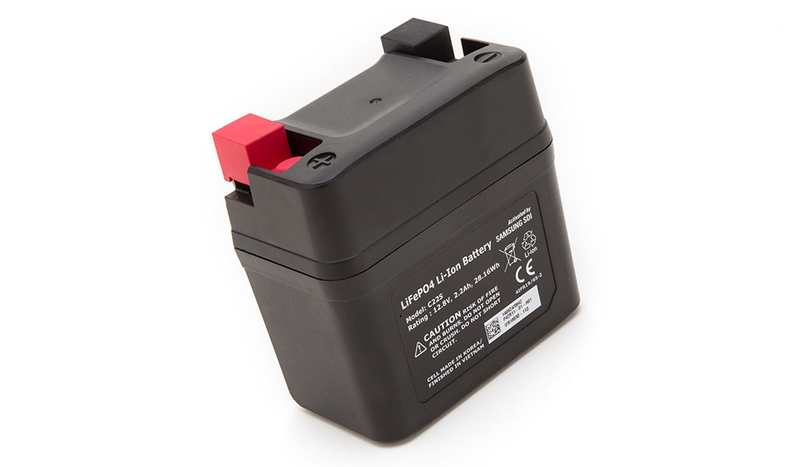 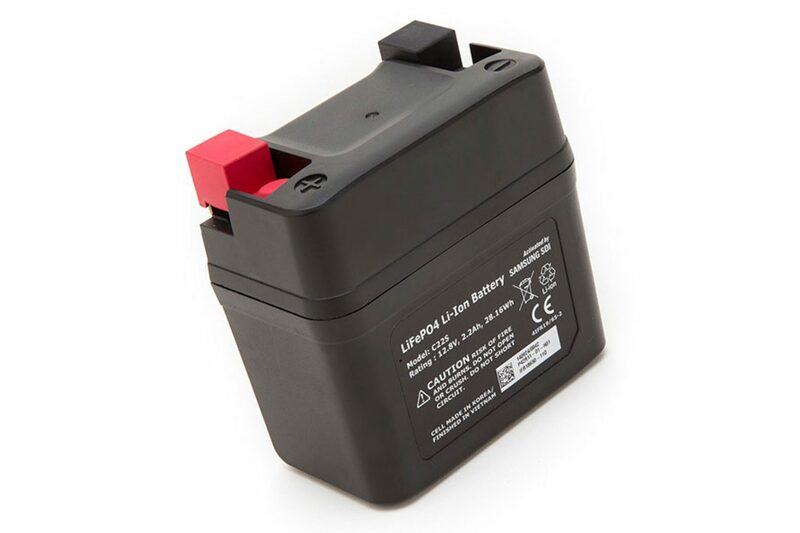 This enables the impressive 63hp to be distributed extremely efficiently throughout the rev range. 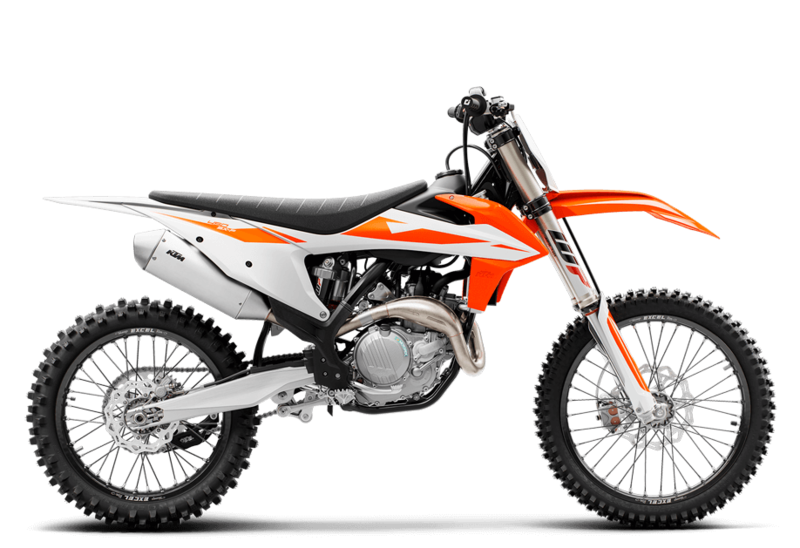 Even with its super-beneficial electric starter this model is still the lightest 450 engine on the MX market. 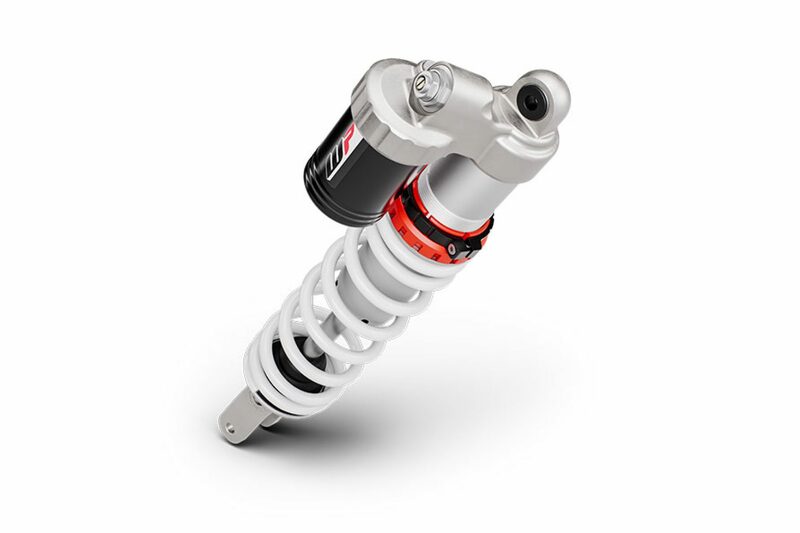 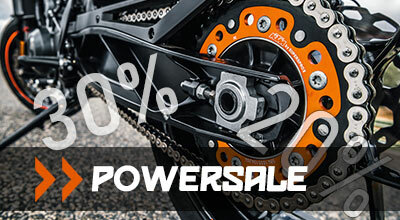 The standard electric starter on the KTM 450 SX-F uses a proven starter drive and a strong starter motor made by Mitsuba. 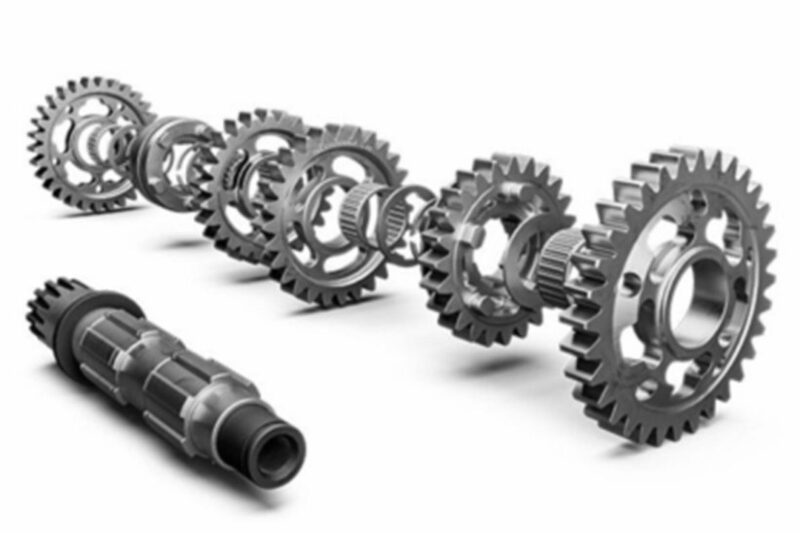 As demonstrated time and time again, it provides quick and reliable starting, saving you precious time and energy when you need it most. 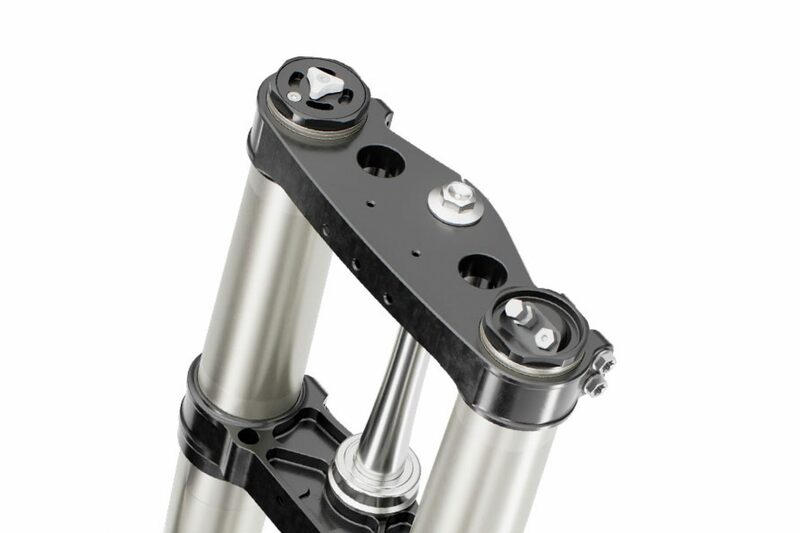 The 95 mm bore cylinder houses a lightweight, box-in-box type piston, made to the very highest standards. 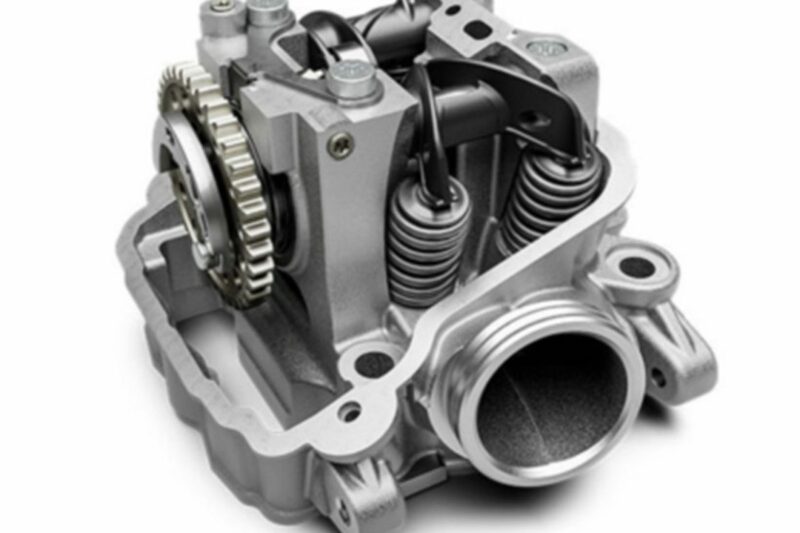 Its design contributes to the engine’s low vibrations and overall engine speed strength. 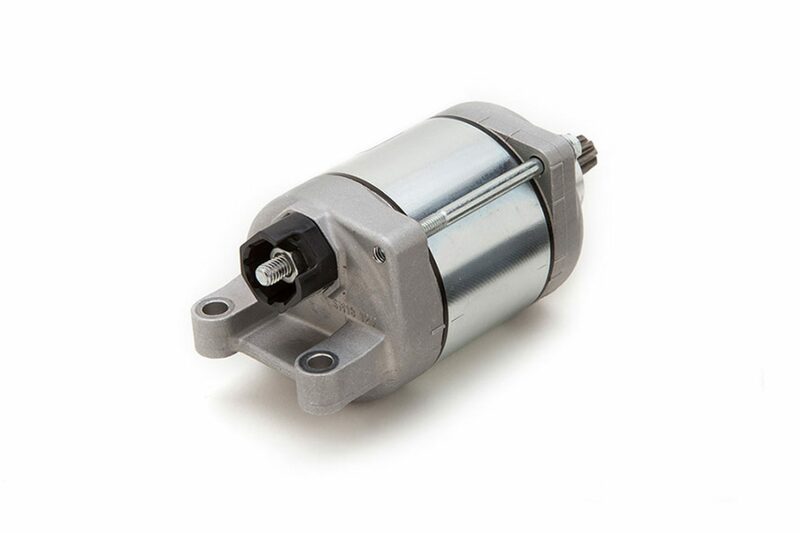 The compression ratio is at 12.75:1 and due to the low oscillating masses, the engine is not only powerful, but also displays extremely lively characteristics. 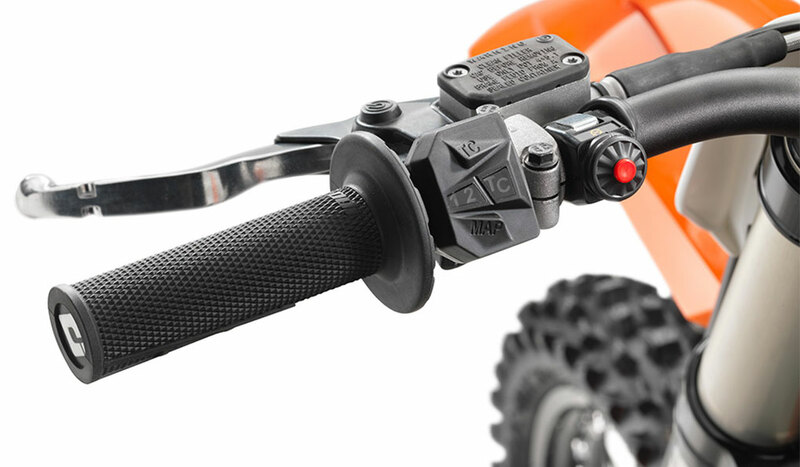 The multifunctional side mounted counter balance shaft masterfully balances all the oscillating forces, while also driving the water pump. 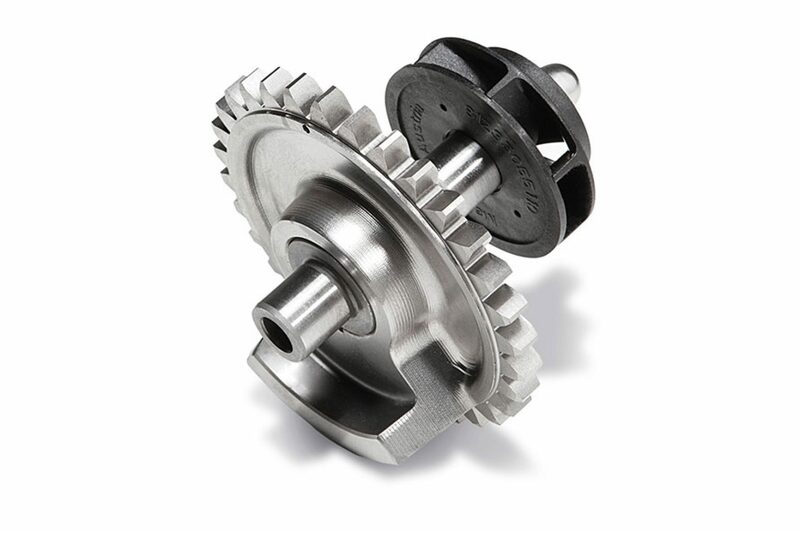 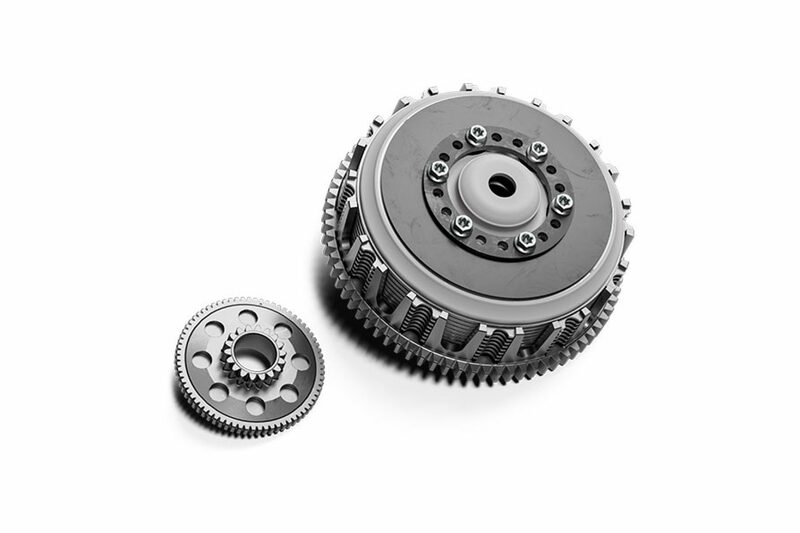 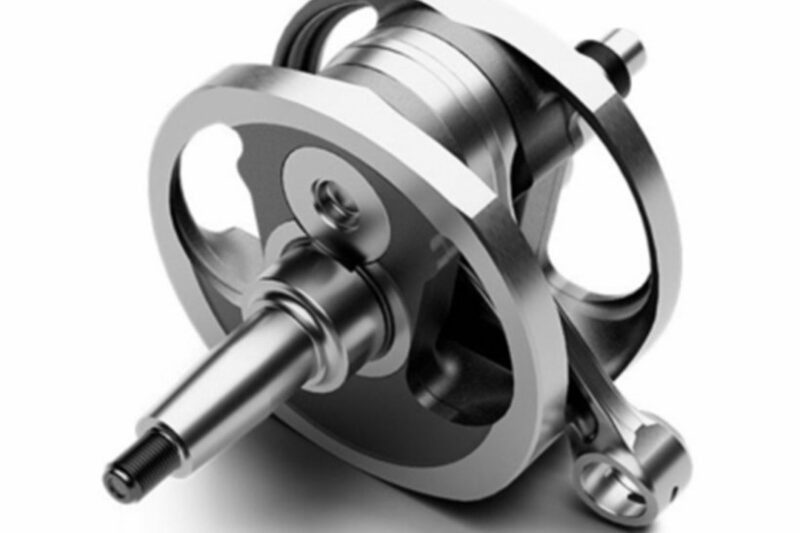 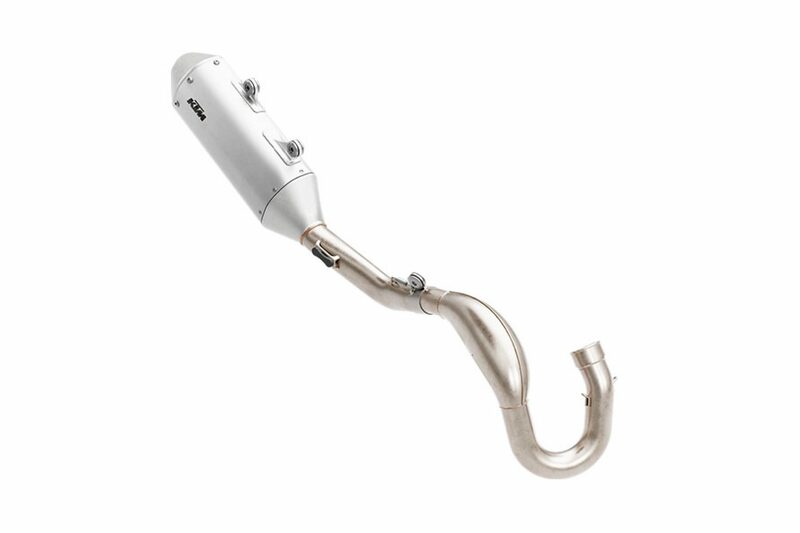 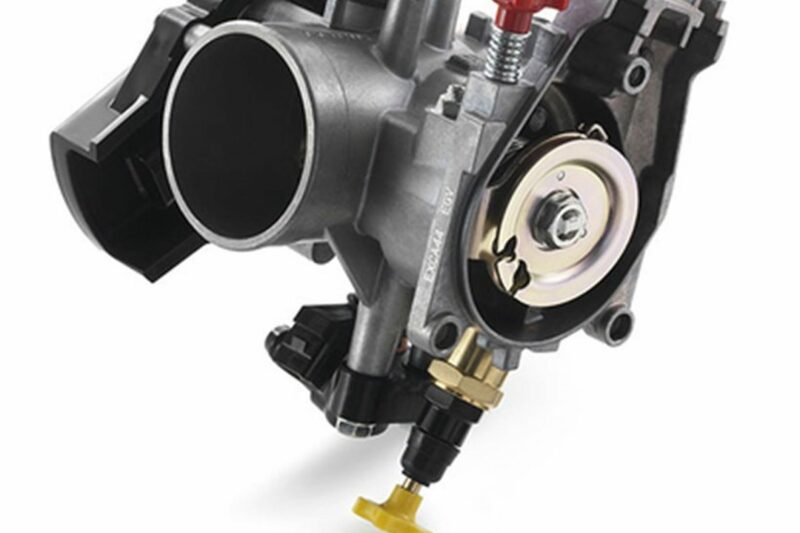 It effectively keeps engine vibrations to a minimum, resulting in the smoothest ride even at the highest engine speeds. 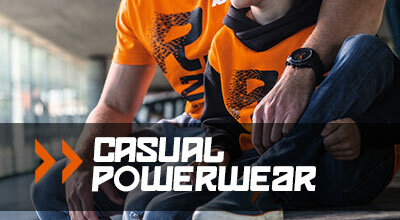 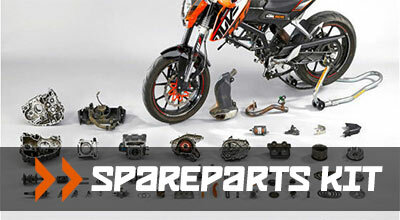 The KTM 450 SX delivers metal twisting torque and requires a strong frame to cope with its immense power. 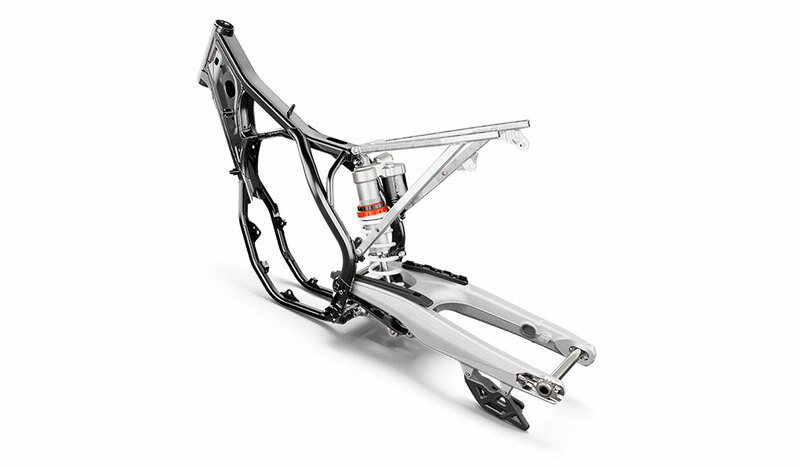 For 2019, a new lightweight, high-tech steel frame was developed to further improve the power-weight-ratio, without compromising strength and durability. 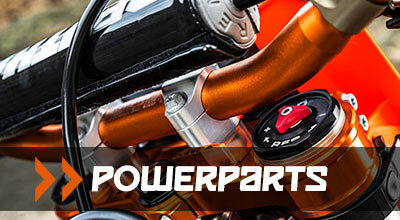 It features refined flex characteristics that ensure the bike soaks up those big hits while also maintaining excellent agility and high-speed stability. 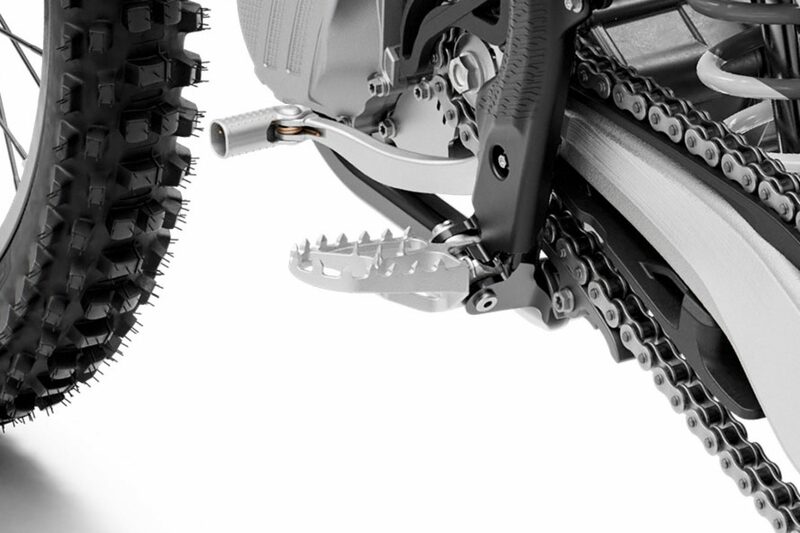 The chassis also features additional innovative elements, like “no dirt” foot pegs and new brackets for mounting an optional composite skid plate. 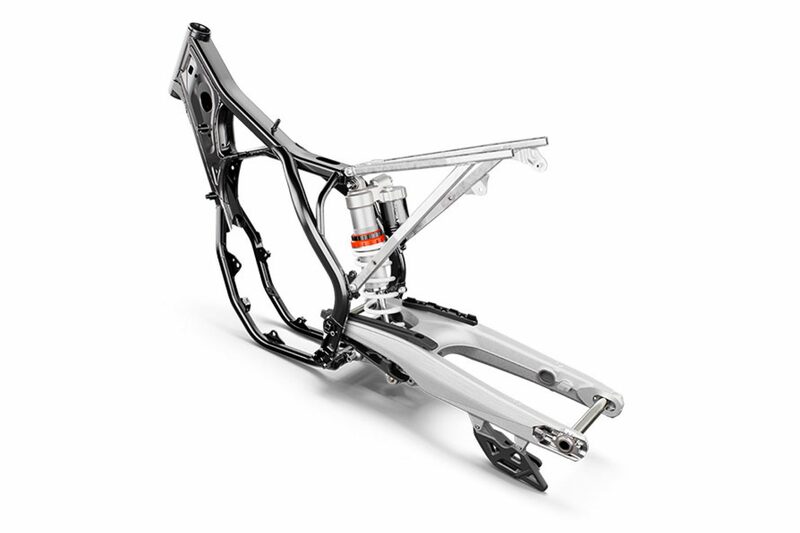 Overall, every element of the chassis contributes to an intuitive, high-performance ride like no other. 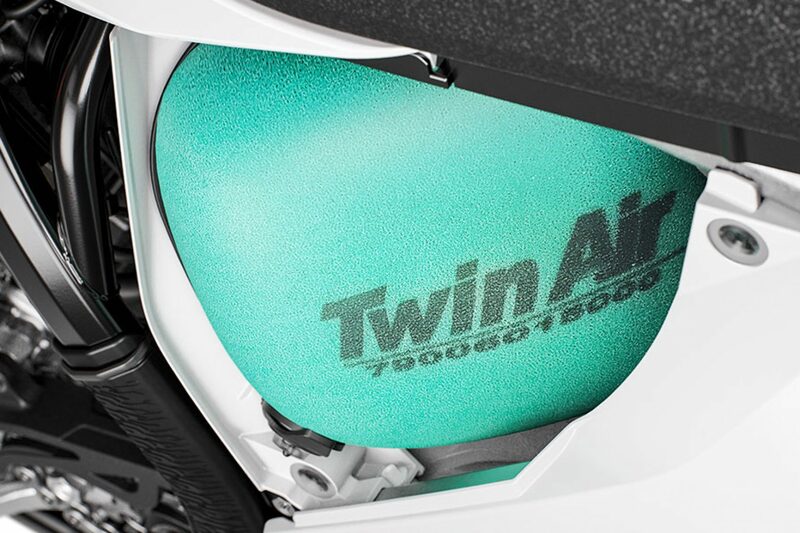 A lightweight polyethylene tank with a capacity of 7.0 liters. 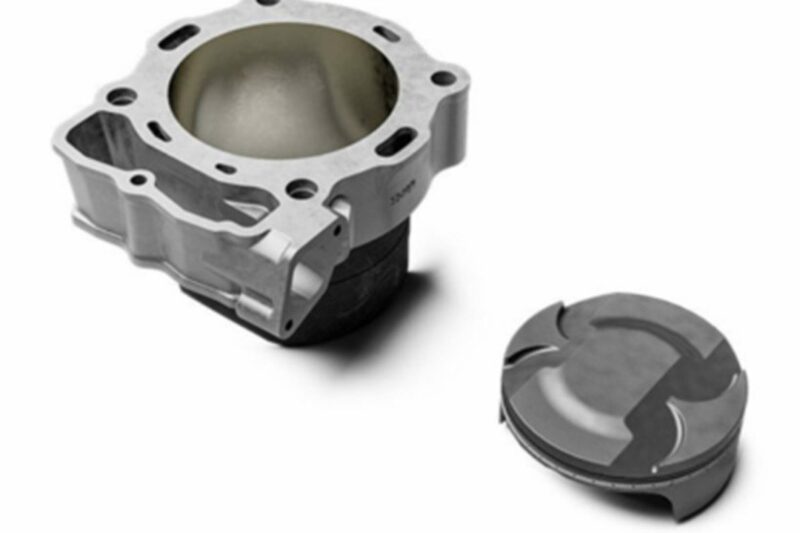 The fuel tank cap has an inside thread, which makes for easy and reliable closure. 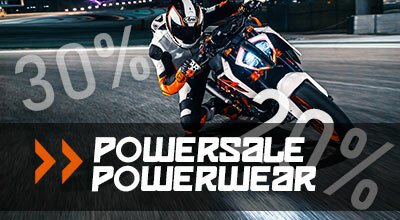 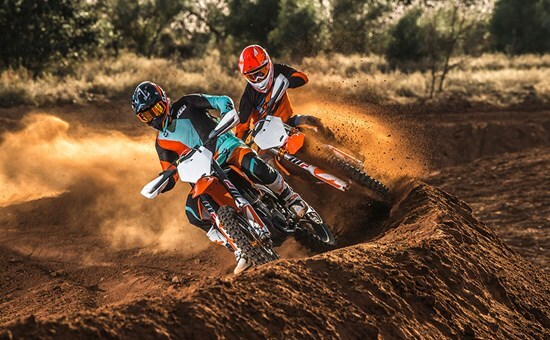 When it comes to the powerhouse of KTM’s SX range, it is imperative that a rider is able to shift his weight quickly and easily to work in unison with the motorcycle. 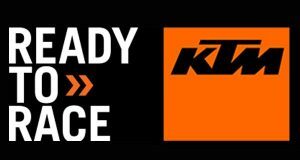 KTM places a great deal of emphasis on creating the optimal ergonomics for high-level performance, making sure the neutral riding position offers the best control. 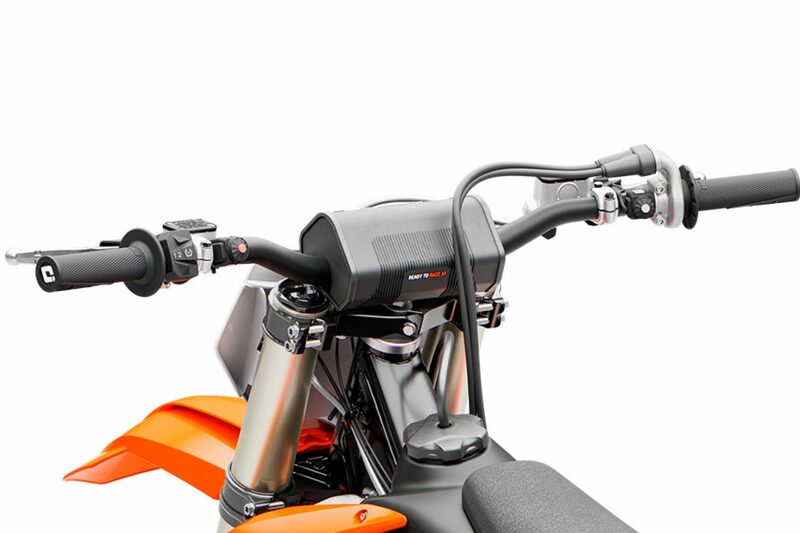 A rider’s main interaction with the motorcycle comes through the bodywork, seat, footpegs and handlebars and these crucial contact points play a vital role in balance and control. 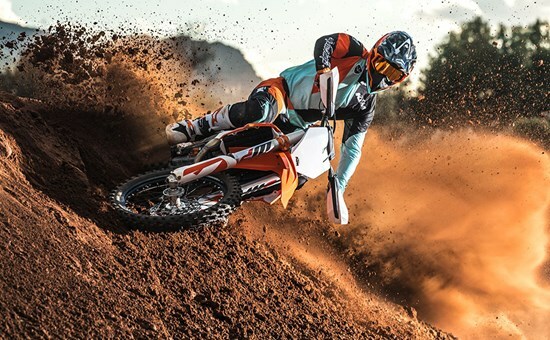 There is no doubt that the KTM 450 SX-F packs a serious punch and by ensuring the very best high-performance ergonomics, a rider has the confidence and control to use it as it is meant to be. 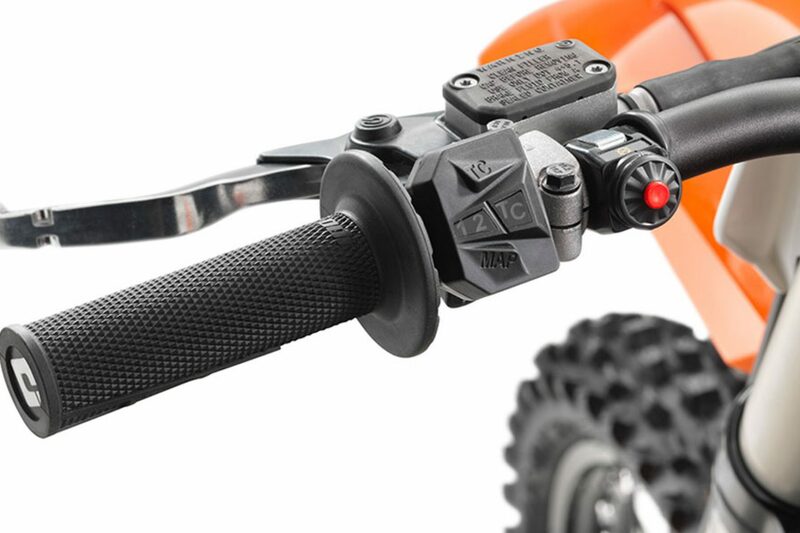 Sophisticated ´No Dirt´ footpegs prevent clogging of the footpeg pivot, even when digging in deep ruts. 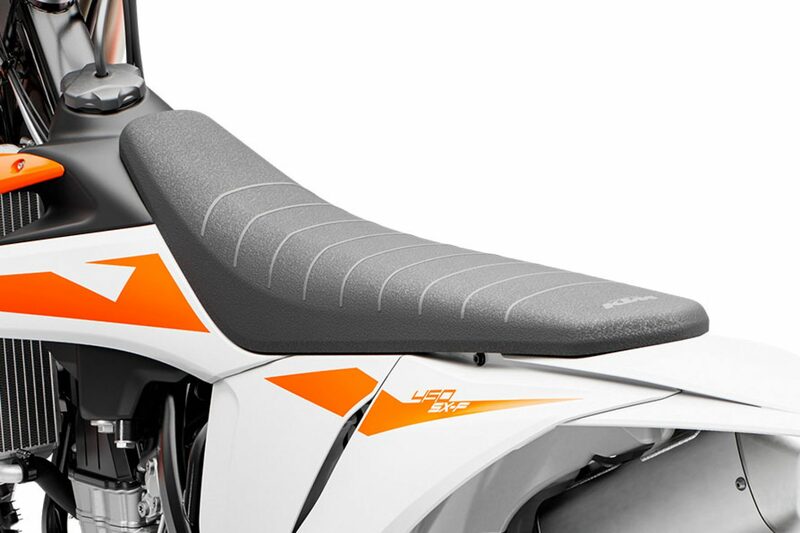 Looking for a higher riding position? 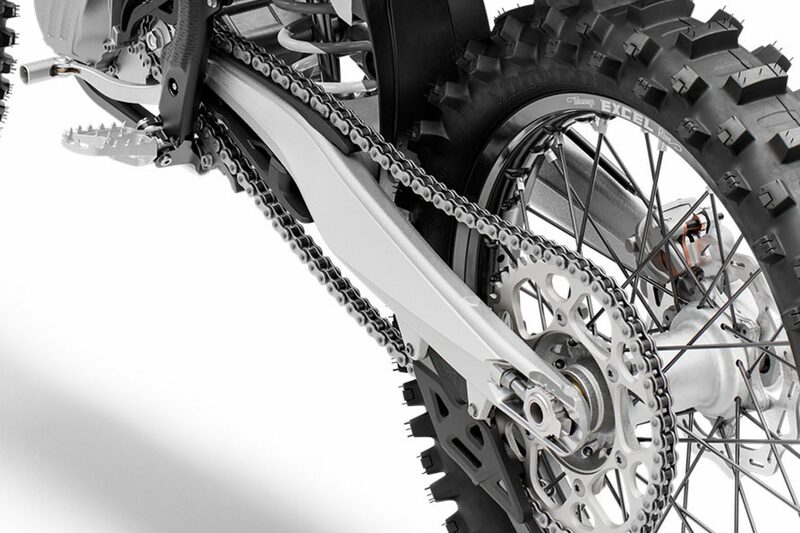 Then just mount the footpegs of the MY2018 EXC models, which are 6mm higher than the SX versions. 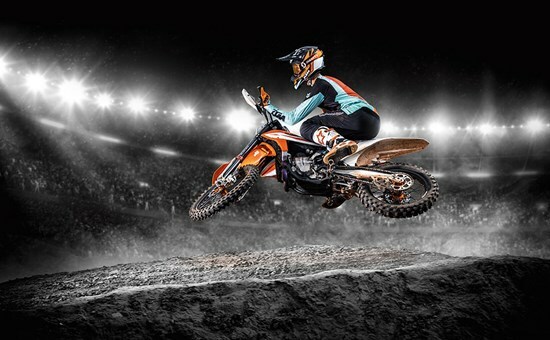 Unloading a KTM 450 SX at the track is an immediate declaration of your race winning intentions. 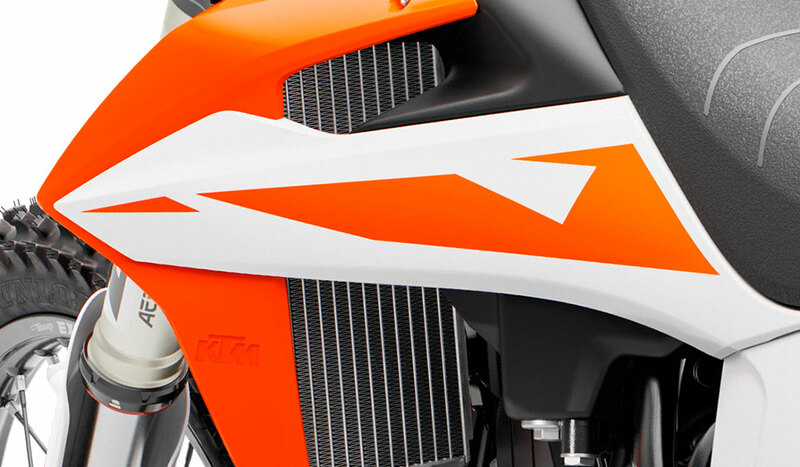 With the help of KTM factory riders, as well as KTM R&D and Kiska Design, they were able to further refine the bodywork of the entire SX range, achieving complete harmony between rider and bike, further enhancing this powerhouse’s dominant appeal. 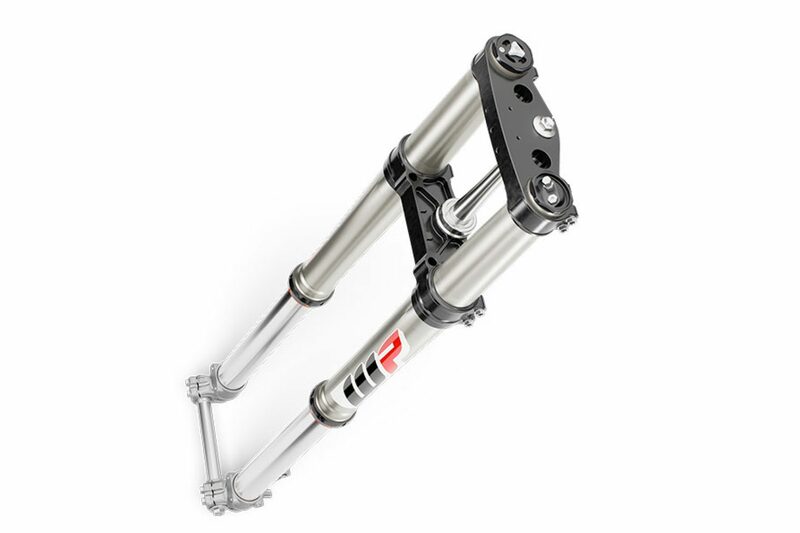 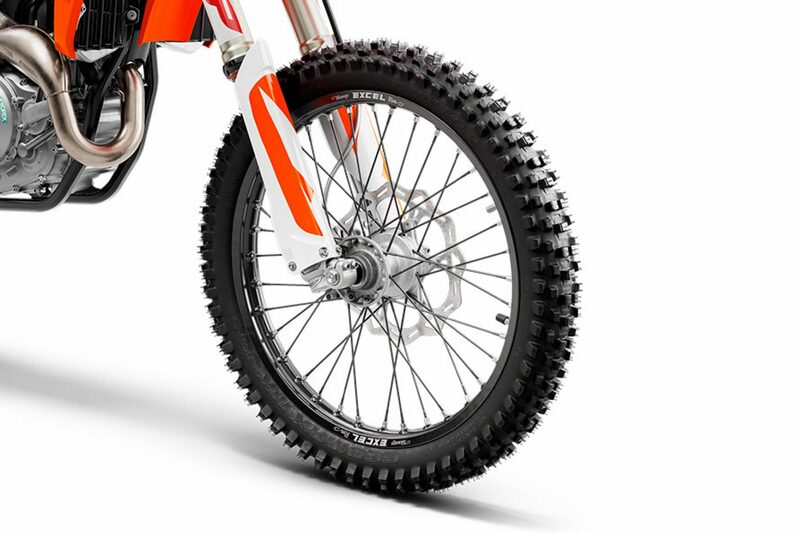 Their main focus when designing the SX range was to provide contact points that allow maximum freedom of movement and improved overall handling. 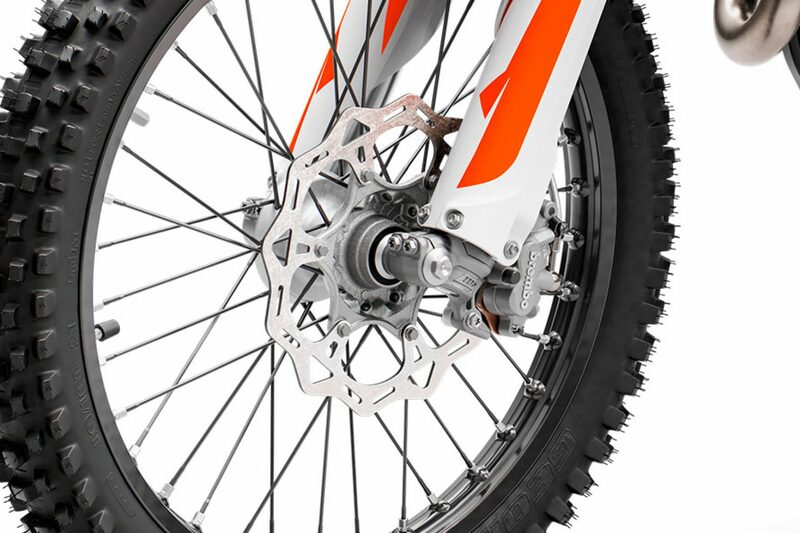 Brute strength at the lowest possible weight is what this bike is all about and can be seen in the intelligent I-beam design on the front and rear fenders, which guarantee maximum stability at no extra weight. 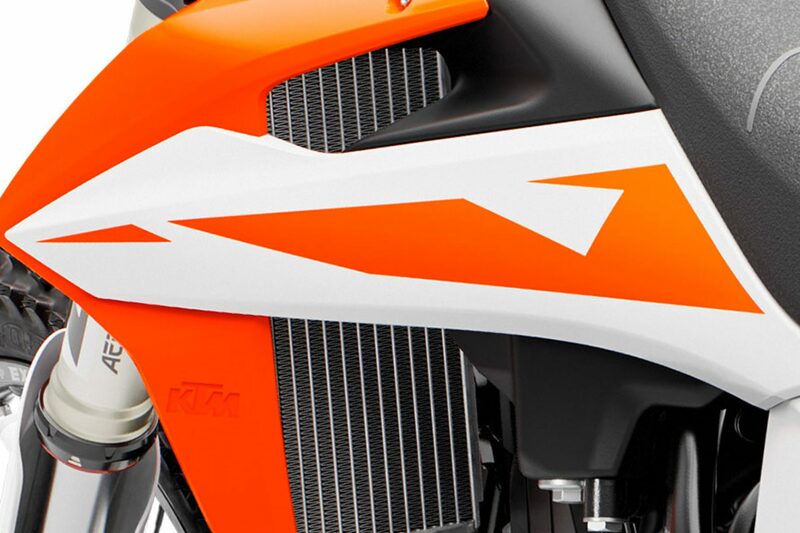 The new aggressive-looking graphics were not only a necessary change, but were designed to send a clear message to the competition that this is not a bike that should be taken lightly.